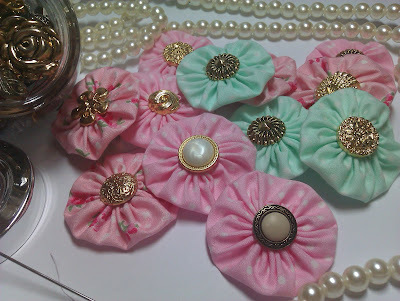 As promised in my YoYo flowers on down the page a bit, I said if anyone wanted a tutorial on how to make these little fabric flowers that I would gladly do one for you. So a few of you have asked for a tutorial, so here it is. These wee flowers are unbelievably easy to make and literally take minutes but they are so pretty and would be beautiful to embellish cards, tags, scrapbook pages, frames, altered projects..........the list is endless. And of course depending on what centre you put in the flowers, they are very flat and light so they would not be an expensive embellishment to have on your cards. And you need very little fabric too. Obviously it depends on the size of flower you want to make. But you can use any type of fabric, even have a wee rummage through your old clothes and that lonesome bag of clothes that was meant to go to the charity shop but now sits forgotten at the back of your wardrobe!! Obviously dont be taking chunks out of your hubby's or wife's favourite t-shirt!! So here we go. Heres the tutorial. As usual if you have any questions or queries, please do not hesitate to contact me. I am always willing to help. Fabric...........any kind. Just whatever you have. 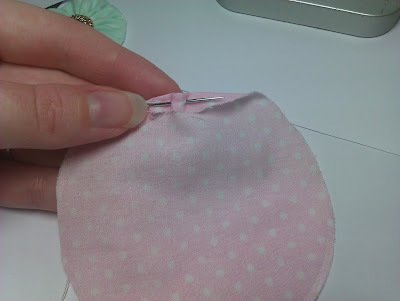 Im using a polka dot fabric I bought in fat quarters. Needle and thread. Doesnt have to be a particular type or colour.....it won't be seen anyway. 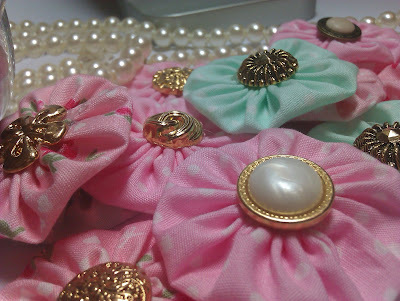 Embellishments for your flower centres......Im using vintage type buttons but you can use whatever you like. Another small flower would be nice or some flat back gems or pearls. An adhesive to glue in your flower centres. I prefer to use hot glue as it dries quickly and adheres the centres so those wee suckers aint going anywhere!! You need to cut a circle of fabric. Now, the size of your circle will determine the size your flower will be (obviously Loops!! Duh!). For example, my circle measure just over 9cm diameter. So that will make a flower which will be just over 4cm. 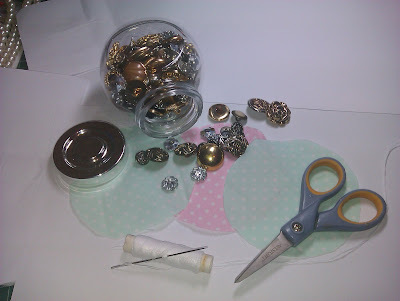 I like to use my Sizzix Circle Die to cut my circles but it is very easy to cut them by hand. The circle doesnt need to be perfect. So roughly, whatever size you want your actual end product flower to be, you need to cut a piece of fabric that is almost half as big again. So if you want a 5cm flower, your piece of fabric needs to be a 10cm diameter circle of fabric. 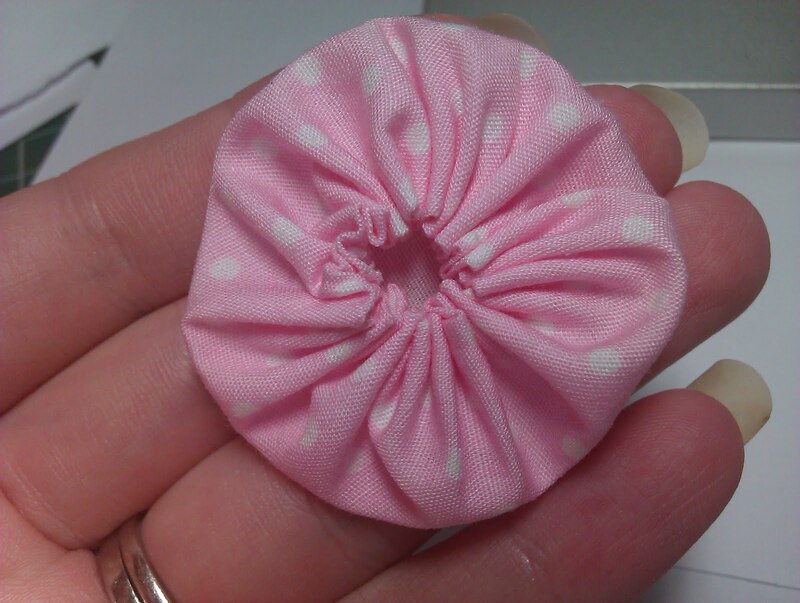 So my fabric is cut in a circle and is 9cm in diameter. If your fabric has a pattern, place the pattern face down. Whatever side you want to be seen needs to go face down. Take the edge of your fabric and fold over the edge inwards just a small amount .......see photos above. It doesnt have to be perfectly even all the way round. Your flower will still work beautifully. 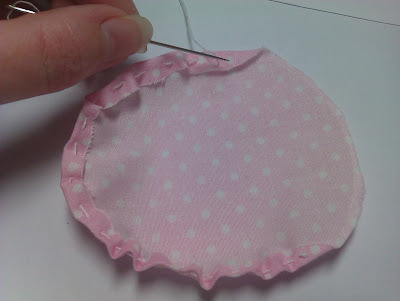 Make your first stitch from the inside out and simply sew a running stitch right around the circle, remembering to turn over your edges. Dont be panicking about how evenly spaced your stitches are, there are no strict rules with these flowers. 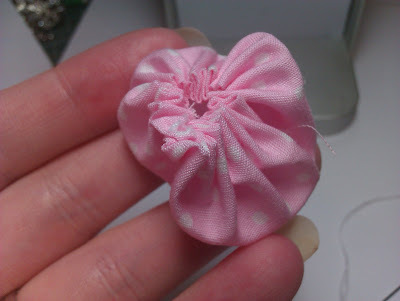 The tighter together your stitches will result in a flower with a lot of pleats closer together. The wider apart your stitches the less pleats you'll have and they'll be spaced further apart. Once you have sewn almost all the way around your flower, you'll need to ensure that your last stitch is as close to the first stitch as possible and the last stitch is sewn from the outside in. See photo 3. 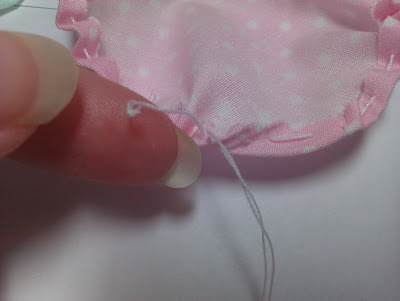 You now need to take the end of the thread with the knot (which was your first stitch) and the needle and thread part and pull them together to pucker your flower. See photo 4 and 5. 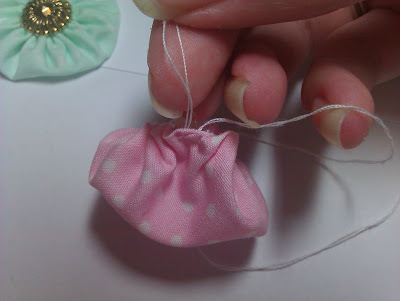 Now that you have pulled both threads to pucker the fabric, it will probably look a bit of mess and look like a little messy sack. Dont panic, it should look like that. 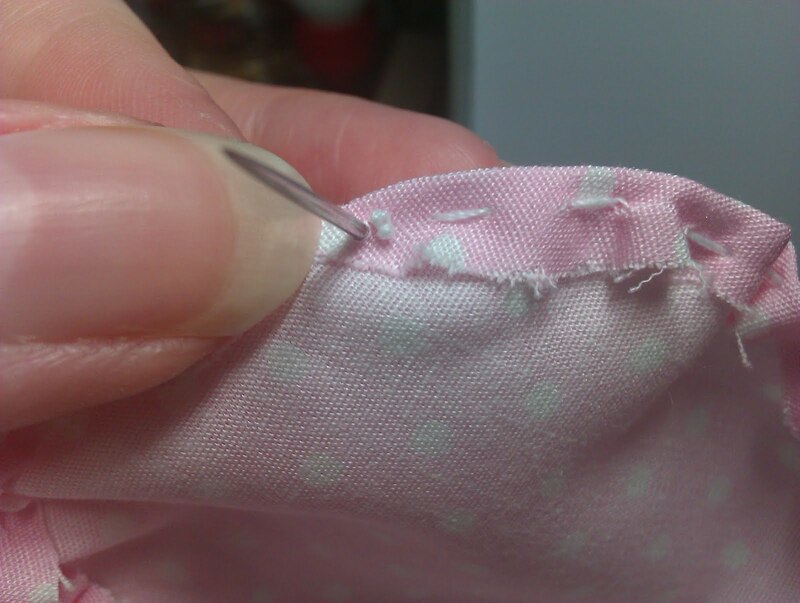 Tie both pieces of thread together down as close to the fabric as possible and snip your threads. See photos 5 and 6. Arrange and flatten your flower into a circle and it should look like photo 7 above. Now its entirely up to you as to how you want to finish off the flower. 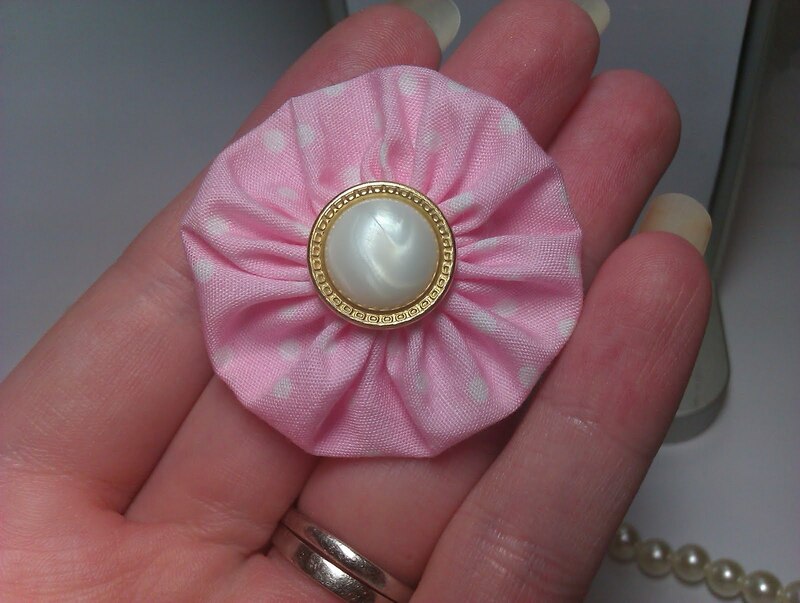 I like to add a decorative button or pearl centres. I prefer to use hot glue when adhering my buttons but you may use whichever method of adhering you prefer. Heres how they look finished. Hi Lee.... beautiful flowers and a fab tutorial... many thanks - will try them soon! What a great blog you've got here Lee, I've really enjoyed having a look through your tutorials tonight... I particuarly liked the paper cabbage roses. Thanks for all your hard work and for sharing your knowledge and creativity so willingly. Gorgeous flowers as usual, thank youfor the inspiration. Great tutorial, might have to try those!! These are gorgeous Lee,thanks for sharing. Hi Lee - you're flowers are just stunning. 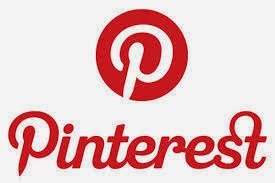 I had a good nosey about your blog and I LOVE the white lace and fabric ones. I will definately be having a go at them. Added your blog to my follow list. these are lovely lee. ad i too was wondering where you got your buttons from! omg, I NEED those flowers! So incredibly cute and the colours just sing to me, especially that soft sea blue ... yum! thanks for the tut they look gorgeous! i love your blog im a follower now. Another fab tutorial Lee! I don't get by here nearly often enough! Great tutorial for the flowers, well done. These are amazing Lee, Fab tutorial too. Lee - these are beautiful!!! You are seriously amazing - I totally am not a seamstress at all - but you totally have me inspired girl! I must try this (will let you know when I do!) Thank you for the clear and awesome tutorial!!! Wonderful work and great tutorial, thanks for sharing! 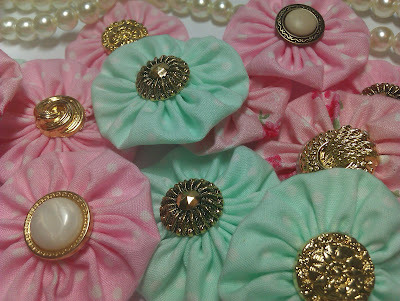 Thanks for visiting the Pixie Blog and for the shout out for Pixie, good luck!